When voting and polling results don’t match political analysts’ expectations, political analysts quickly look for what they missed. Economic results haven’t matched central banker expectations, central bankers are far overdue to reevaluate. Donald Trump and Bernie Saunders forced political analysts to revise polling methods and look fresh for messages in the data. As one analyst phrased it in the Washington Post, “I feel like in some ways my brain has to think differently than it ever has.” Central bankers could learn from the openness of political analysts to new data. Investment was less than expected. Why? Falling product costs combined with high global cash means less demand for cash — the “cash gearbox” effect. This lowers the natural interest rate. Purchases fell when prices increased. Why? Shoppers prefer to buy more when prices fall. These aren’t surprises to regular people but they are to central bankers. Why? Raising prices through quantitative easing (QE) will cause fear among shoppers, causing them to accelerate goods purchases, causing scarcity, causing prices to raise more and causing higher production. Lower interest rates will cause companies to increase investment in people, buildings, equipment and more. These assumptions are from a world where goods scarcity and increasing costs dominate. Are we living in that world? No. Not since the mid-1990s. Simply put, it costs less to make stuff – especially globally traded goods. Notably, “research-to-retail” product costs have fallen. Why does this matter? Because it reflects the growing importance of value chains, beyond individual factories. Here’s another data twist, economic data averages don’t highlight these value chains because they vary by companies within industry sectors. To see more clearly, analysts need to use data from public company reporting. A related change is that productivity — the way people commonly describe it – hasn’t fallen the way formal measurements suggest. The Euro Area total purchases were fractionally down since 2008, despite QE pushing up prices 5.9%. Higher prices hurt purchases – common sense to shoppers, but a shock to central bankers who expect higher prices to cause consumers to buy more. But people know a good deal when they see it. In stark contrast to the total, sensitive durable categories showed a different story – purchases grew as prices fell. Of course, products vary by country depending on regulatory policy, import dynamics and more. 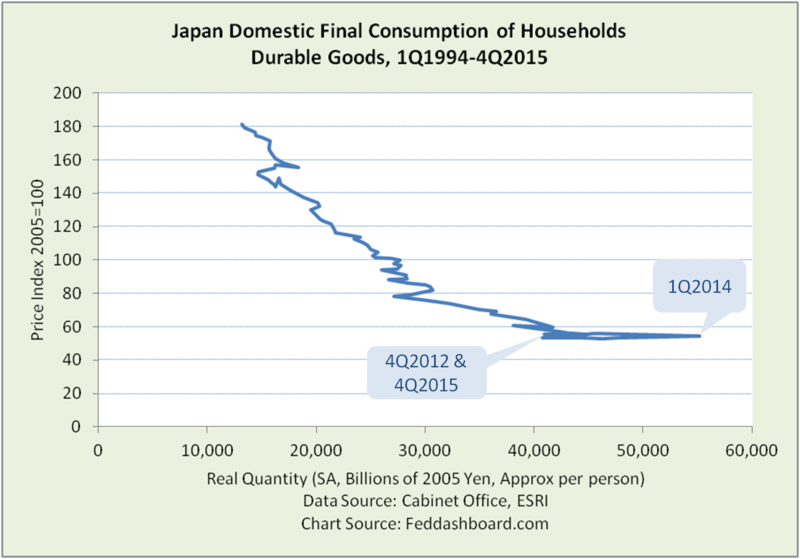 Japan’s nominal retail sales were down 0.5% compared to a year ago. Retail sales were saved by stronger auto, and medicine and toiletries sales – all other categories down. 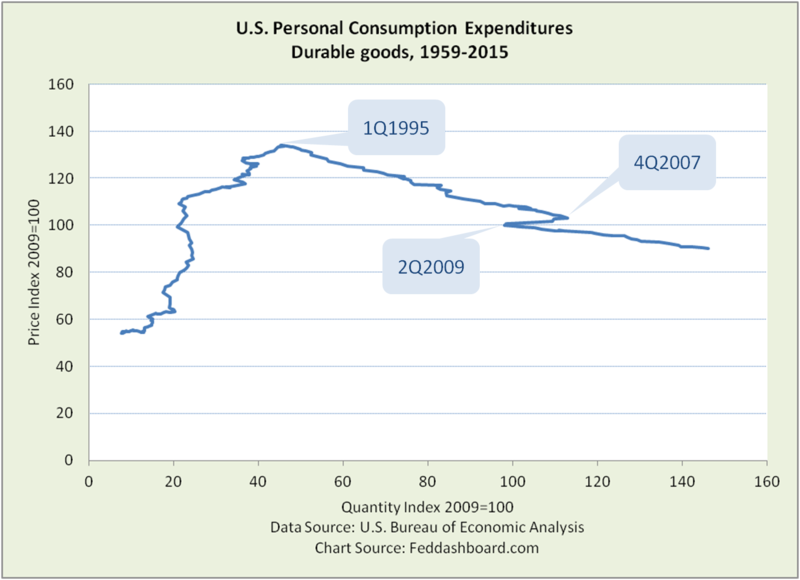 The deeper and more troubling trend is how a combination of QE and consumption tax increase hurt durable goods purchases more than the 2007 crash. Durable goods purchases reversed in 1Q2014 and still haven’t recovered, currently back at 2Q2011 levels. Durable goods purchases grew and prices fell, according to today’s recent “third estimate” from the U.S. Bureau of Economic Analysis (BEA). Yet, prices aren’t falling as fast as before the credit bubble burst. The decrease in price relative to increase in purchases from 2009-2015 was about half the pace of 1995-2007. To the extent the Federal Open Market Committee (FOMC) pushed up prices with QE, this must also be considered in harm to purchases. 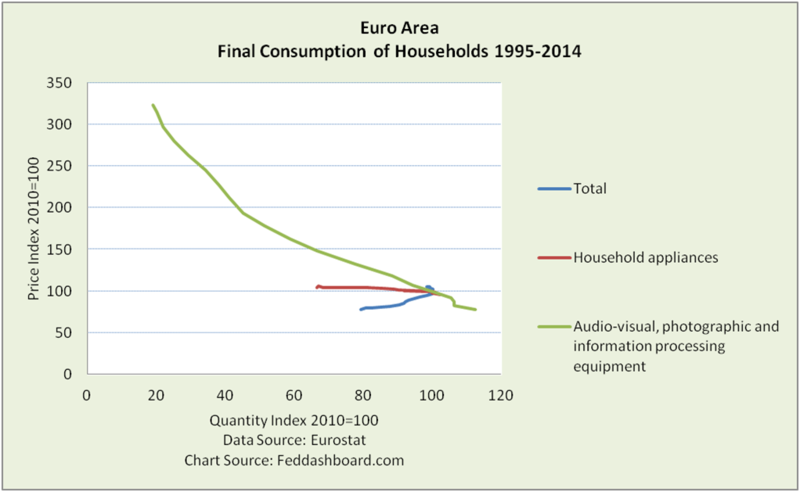 For a view by product types, see European, U.S. and Japanese analyses.